The most efficient crew size for performing sidewalk snow removal activities has been discussed, argued, and subjected to trial and error testing. Since sidewalk snow clearing emerged as a separate (or specialty) business, the issue became more important. By adding mobile crews, we discovered the importance of correct crew sizing. 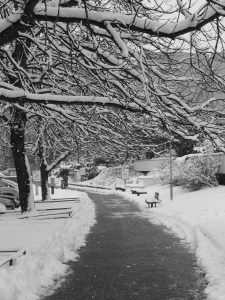 In today’s competitive labor environment the need for higher productivity and increased quality suggests a ‘new look’ at sizing sidewalk snow removal crews. Let’s look back at our (non-snow related) experience with small crews. Most of us at some time in our careers have worked as a one-person crew. Remember how much you could accomplish in one long day?? Remember the first really good helper, the one who read your mind and did what you wanted him to do?? You increased your production when you added the helper — but you did not double it. Sidewalk snow removal (and snowplowing too, for that matter) is a series of solo, one-person tasks. Unlike landscape installation or construction, sidewalk maintenance crews do not handle heavy or awkward materials or equipment requiring more than one person to improve efficiency. This lack of synergistic benefit on a per task basis encourages us to think of our crews as combinations of one-person crews. Loading heavy sheets of 4’ x 8’ plywood is a good example. One person can load 30 sheets per hour by himself, but a crew of two can load 75 sheets an hour. The difference is called synergy – which means that the whole is greater than the sum of its parts. By working together, the plywood loading crew actually increased the output per person from 30 sheets per hour to 37.5 sheets per hour. What would the effect be if you added a third person to the plywood loading crew?? It would be detrimental to the overall production synergy. Sometimes “more” is not necessarily “better”.